I have recently been given some wild black morel mushrooms. I know that you aren't supposed to eat them raw, as they contain toxins which must be cooked out (at least now I know that... good thing I only ate a tiny piece raw!). However, how long should they be cooked to be safe? I was thinking of sauteing them, which I am fairly confident will cook them "enough", but also of making them in omelets, or as a topping on pizza. Either of those could result in rather minimal heating (I usually make my omelets so that the eggs in the middle are still a bit wet). Should I cook the morels first, and then add them as a pizza topping/omelet filling? Or is this overdoing it? 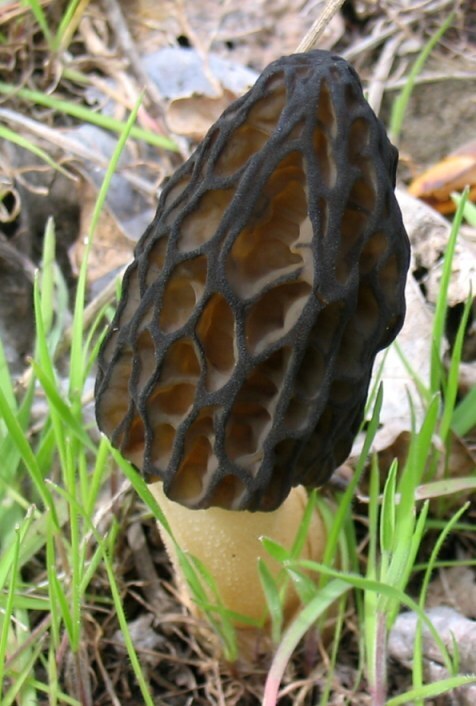 I've looked through a number of recipes, and the vast majority of them indicate that you should cook the morels thoroughly (preferably in butter) first, before using them as a pizza topping or in an omelet. I did find at least one recipe for a morel omelet that did not call for pre-cooking the mushrooms, however. I must admit that I did my research a bit late, as I had already decided to risk it and made an omelet with morels, as I had not yet received any answers to my question. I added the morels to the raw egg, rather than putting them in as a last-minute filling just prior to folding the omelet, so they did cook a bit during the process. The result was actually quite delicious (I also used some fresh garlic, chives, and Gruyere cheese), and I did not become ill. However, it does seem that some people react differently, and alcohol consumption can greatly enhance any negative reactions to wild mushrooms. Given the information I found on the Internet (none of it terribly authoritative, as the vast majority of quality information was on small sites maintained by wild mushroom hunting clubs and enthusiasts), I would not repeat my omelet without pre-cooking the mushrooms, nor will I make pizza without pre-cooking them. The consensus seems to be that they should be sauteed once until "thoroughly cooked". At least one site (amid heavy cautions) specifies that this is usually 8-10 minutes, although I suspect that this is for intact mushroom halves, rather than small pieces (morels should always be sliced lengthwise to ensure that you can remove all the insects from the hollow center). It needs to be stressed that even with the proper cooking, it seems some people have strong reactions to wild mushrooms, so use caution and moderation when trying them for the first time, and do not try them with any form of alcohol until you are sure that you can eat them without problems. Edit: I misunderstood the original question. The answer below applies to a different variety of morel than the one the OP is asking about. There are different types of morels. I am afraid I cannot advice you on exactly which type is which. The one that is poisonous is very common in Sweden. Its local name is "stone morel", but I have no idea what the variety is called in English. If you want to eat them you have to blanch them several times, cooking them for 5-10 minutes per "round" of blanching. And you need to throw out the water in between the rounds. Merely sauteing them will not kill the poison. Actually, blanching them will not kill the poison either, but most of it will be transferred to the water. This particular type of morel is actually outlawed in Sweden now. It is that dangerous. This means that they cannot be sold or served at restaurants. However, it is not illegal for individuals to pick them and eat them themselves. Personally I eat them (they are absolutely delicious), but only after having blanched them three times and thrown out the water in between. However, I will never serve them to other people unless I know for sure that they know what they are getting into. Sadly, the more you blanch them the more you dilute their flavour. But that is just a fact of life. In other words, you cannot saute them raw. No way. If you absolutely want to eat them, blanch them in lots of water for 5-10 minutes, then throw out the water. Repeat for a total of three blanching rounds. After that you can use them like you would any other mushroom. My recommendation would be to sautee them in lots of butter with a little chopped onion, then adding a splash of amontillado sherry and some cream. Add salt/pepper to taste. Serve the sauce (and yes, it does deserve to be referred to as the main component of the dish) with a nice steak, medium rare, and some kind of potato based side dish. Morel should be soaked over night in salt water it kills bugs and snails inside of them. I never eat morels raw. What heat & fat do you use for fried mushrooms? How safe is it to harvest wild sassafras? How long is too long to cook meatballs in sauce? I marinated a skewer with chicken not cooked next to peppers and mushrooms also uncooked and froze them - will i get sick when i cook them?